Is America heading towards fascism? They were pulled aside while going through customs because of their Arabic-sounding names, according to family friend and lawyer Chris Mancini. Immigration officials let Camacho-Ali go after she showed them a photo of herself with her ex-husband, but her son did not have such a photo and wasn't as lucky. Mancini said officials held and questioned Ali Jr. for nearly two hours, repeatedly asking him, "Where did you get your name from?" and "Are you Muslim?" This week, two Indians (who had legal permits) were shot in a bar in Kansas by an anti-immigrant bigot - Adam W. Purinton (wearing military medals) who tossed ethnic slurs at them and suggested that they did not belong in the United States. He killed one and wounded the other Indian. The assailant was captured in Missouri state. Early in February, a trial began in federal court in Tennessee of a self-professed Christian minister Robert Doggart - who plotted to kill Americans of another faith (Islam) to prove his “commitment to our God.” The trial did not get much publicity simply because the man on trial is not Muslim. If he were Muslim, Dean Obeidallah says, we would of course have heard of his sinister plot. But as we have seen time and time again, terrorist plots by non-Muslims are met with a collective yawn by most in our media. 2. Destabilized government in the wake of WW I. Both countries were at the mercy of factional strife, coups, and street fighting. 3. Fear of Communism. When the Communists came to power in Russia, they executed Tsar Nicholas II, cruelly bayoneting his daughters. This sent a down every royal spine in Europe (many of whom were related to Nicholas.) The wealthy also feared for their power and riches. Communists were active in both countries, trying to get themselves elected or take the government by force. Both Mussolini and Hitler exploited this fear to secure help from the wealthy and powerful. 4. Wounded national pride in the wake of WW I. Although Italy was among the victors of WW I, it was quickly marginalized by the other victors. It received none of the spoils of war and no voice in the armistice. Germany lost the war, much territory, and had to endure the Treaty of Versailles which inflicted total blame and financial reparations. 5. Many war veterans from WWI. The streets were full of experienced soldiers, jobless, often still armed. They were ripe to be organized against other political parties. Political disputes often spilled over to gunfire in the streets. These conditions favored the most ruthless political party. For instance, millions of jobs, esp. in the manufacturing sector have moved away from the USA to countries, at least since the 1990s, where the costs of manufacturing are lower. Most of these jobs never returned to the USA. Many of those former employees are either out of job or are forced to work for low-paying jobs in parts of the USA that are commonly called these days as ‘rust belts.’ The 2008 economic melt-down, brought about by Bush Jr.’s hawkish policy, financial deregulation and neo-Crusades - the perennial wars in Afghanistan and Iraq - saw many of their life-time savings evaporate; many lost their homes and businesses. [The 2008 financial crisis led to the Great Recession when housing prices fell 31.8 percent, more than during the Depression of the 1930s. Two years after the recession ended, unemployment was still above 9 percent.] Although by the end of Obama’s presidency in 2016 the unemployment rate had declined to below 5% many low wage-earners, and surely unemployed Americans, remain bitter, angry and frustrated. They like to see a change for the better. They have been the major force along the ‘rust belt’ to elect Donald Trump as the 45th POTUS. Ever since Barack H. Obama was elected as the 44th president, the USA has witnessed a series of tense events along racial fault lines (mostly involving police). 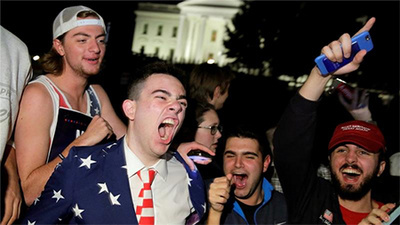 The election outcome in November 2008 was undesirable to many White Americans who refused to accept the evolution of their country and government that has increasingly become diverse, slightly more tolerant on sensitive issues. Many of them joined white supremacist militia groups, preparing to bring about a race war against non-Whites and a federal government that they considered illegitimate and run by a ‘disguised Muslim’ (and not a ‘faithful’ follower of Jesus Christ) who – in their faulty understanding - was not even born within the USA. 9/11 had already dug a gigantic, deep wound in American pride that had defined American psyche and politics ever since. No time in its history was the US mainland ever attacked by non-state actors that killed so many - nearly three thousand citizens. Rather than finding the root causes of the attack, the USA and its western partners attacked first Afghanistan and then Iraq savagely, killing in the process nearly a million unarmed citizens of those countries that had nothing to do with 9/11. Those regimes were soon toppled, the entire infra-structure of those countries destroyed, and puppet regimes installed. The rest is history! In spite of its gaping flaws, America’s war in faraway countries that did not attack the USA was sold to the general public and soldiers as a necessary and justifiable war. As part of the military’s rule of engagement, unarmed civilians – old and young, including toddlers and infants - were mercilessly killed or maimed unprovoked. Thanks to western savagery and the sectarian heavy-handed practices of the U.S.-supported Iraqi government, a new nemesis – Daesh (more commonly called ISIS/ISIL), an un-Islamic terrorist outfit – has emerged in the scene, which seems to be more dangerous and determined to not only take over the ownership of Iraq and Syria but also to encourage terrorism in both sides of the Atlantic Ocean. Their mindless nihilism has killed and injured mostly Muslims; a much smaller number of Europeans and Americans has also been victimized by their brainwashed comrades. Daesh has recruited thousands - Muslims and non-Muslims alike - to join the rank and file to kill and be killed in an imbalanced war with the West. They remain a formidable force unless they are defeated both ideologically and materially.